Photography: Some of the Best! The islands are located some 20 miles south of San Diego, and actually reside in Mexican waters. It can take anywhere from 1 hour, 15 minutes to 2 hours to get there depending on sea conditions and how heavily the captain leans on the throttle. Dive boats frequent two locations on the islands; Lobster Shack, and Keyhole. Keyhole is at the south end of North Coronado Island. Lobster shack is more towards the north end. Depths at both sites are in the 15 to 80 foot range with 6o feet being a good planning number. Keyhole has an archway, which is deep enough to dive in at high tide. It's actually a nice place to spend a safety stop if you can stand the surge. The surge is less severe if you're away from the arch. Under the right conditions, you can swim through the arch and dive the other side. Underwater life is different from the kelp forests. Seals are common. Echinoderms like brittle stars, urchins, and starfish are common. There are relatively few other invertebrates, and more small fish. The local conditions are unfavorable for filter feeders, though sea fans are fairly common. All the islands are heavily fished by the Mexicans, and the seals. Large fish are uncommon, unless they are Garibaldi which taste terrible or Morays which have a bad temper and probably don't taste very good either. Lobster shack is similar to Keyhole, but without the surge. The Middle Grounds are less heavily fished, but this site is only divable under very good conditions. 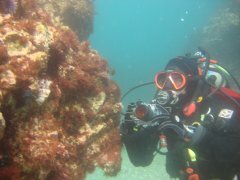 The Coronado’s make a nice dive if you want Pinnipeds and good vis. 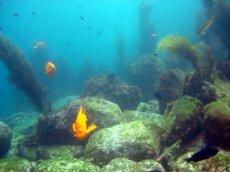 But if you're looking for super abundant sea life, stick to the kelp forests.